How do you describe one of the greatest football player of all time? Sure you can look at his statistics and his records, you can watch the highlight videos of his great plays, you can talk to his teammates and coaches but you can't really quantify the heart, toughness and grit that made the greatness. This website tries to showcase the life of football great Walter Payton - his triumphs on the football field and his fight against the deadly disease of cancer. It is but a drop in the bucket of highlighting Sweetness' greatness. 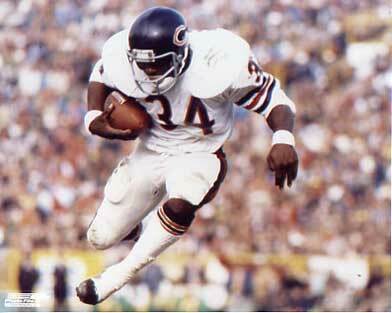 Walter Payton spent his entire 13 pro-career with the Chicago Bears of the National Football League (NFL). He played for some pretty bad Bear teams, but his love for the game always shined through. This web site is not associated with the late Walter Payton or the National Football League.